The Gold Charm shop occupies the former entrance lobby of a theatre, once used by a pioneering film maker. 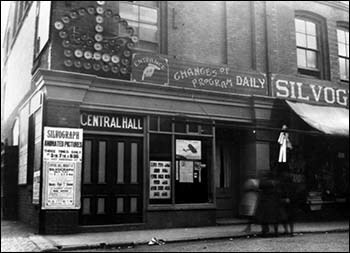 In the photo on the right, taken by Charles O’Reilly in 1909, the doors are beneath the words “Central Hall” – where the shop window is now located. The photo is shown here by kind permission of Ian Meyrick. Arthur Cheetham was born in Derbyshire but moved to Rhyl in the 1880’s as a phrenologist. He gave lectures on phrenology (the would-be science of judging mental faculties by reading the “bumps” on one’s head) on the Rhyl sands. He was fascinated by electricity, cameras, gramophones, printing and “living pictures”. He first began showing films in Rhyl in 1897. 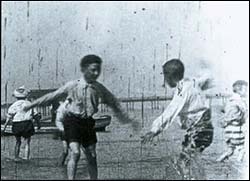 In January 1898 he made his debut movie, showing children playing on the sands in Rhyl. The still picture on the left is from that film. At least eight of his films survive to this day, including his 1903 record of the visit to Rhyl of “Buffalo Bill” Cody. His film of the 1899 football match between Blackburn Rovers and West Bromwich Albion is the oldest known British soccer film. Few towns have early films as a record of their past, but thanks to Arthur Cheetham part of Rhyl’s history has been recorded in this way for posterity.